For a romantic, private get-away or honeymoon accommodation. Stay in our deluxe studio room with a luxurious spa bath – perfect for honeymoons. 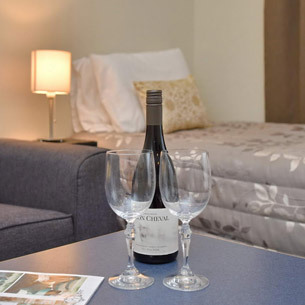 There are a selection of restaurants within a short drive from our motel or stay in for the night making use of our excellent cooking facilities. Quality bedding, large King or Queen sized comfortable beds and spotless cleanliness make for an ideal getaway. Enjoy the sights of Christchurch from our convenient location and let our hosts offer you great advice on the best activities. Northcote Motor Lodge offer a continental breakfast service delivered to you, no need to rush out the door in the morning. Warm, soundproof and sunny - enjoy a glass of wine on our balcony. King sized bed and all the amenities. Perfect for honeymooners or anyone just wanting the ultimate get-away. Two units are upstairs off the balcony for enjoying a drink in the sunshine and have full kitchen facilities if you'd prefer to eat in. Affordable and comfortable, these are great studio units for a night away. Situated well away from the street, they are very quiet. All units have their own kitchen and bathroom facilities. These units all have car parking right outside the door.